Marin joined Argyle on a season-long loan from French side Lorient, with a view to a permanent transfer. A right winger, he started his career at Auxerre, also playing for St Etienne and Sedan before the move to Lorient. His Argyle career never took off and his loan was cancelled after four months and just six appearances, five of which were as a substitute. He then joined Bastia on loan before three years in Switzerland with Sion and Lausanne-Sport. A brief spell in the United Arab Emirates with Dubai Club followed, before returning to Europe in September 2012 to play for Skoda Xanthi in the Greek Super League. Two years later he moved back to his homeland to sign for Boulogne, just 30 miles across the Channel from England, in the French third tier. He then had a brief spell for Toulon before signing for AS Magneta in New Caledonia, a French-administered territory located in the south-west Pacific Ocean, around 750 miles east of Australia. ...and despite his clearly French provenance, given the club from which we signed him, it took me a little while to figure out that he hadn't indeed arrived from Leyton Orient!! Nicolas Marin was one of Paul Sturrock's three 'big signings' for 2008-09, the other two being Emile Mpenza and Paul Gallagher. 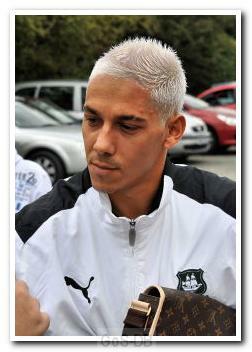 Nicolas, arriving with stylish silver hair, became a season-long loanee and arrived in the hope of being another French player to become a fan favourite at Home Park. In the end, Nic only played six games and left five months early, but he was still a hot signing that could've been something special, had he only been given more than just one start!